I've always been a fan of hard apple cider, I find it a refreshing option from beer & wine especially on a warm summer day. Recently a new hard cider has come on the scene which in our opinion puts most others to shame. Minneapolis-based "Crispin Super-Premium Natural Hard Apple Cider is true to the apple in the way a varietal wine stays true to its grape. It’s naturally fermented with classic red wine yeasts for full-bodied taste, using premium apple juice blends not from concentrate, and without added malt, spirit or grape alcohols." It's crisp & refreshing without being overly sweet like a lot of other ciders tend to be. Right now Crispin is available in Original, Light & Brut but we are really excited about the Honey Crisp varietal coming in October. Recently, Crispin & Heavy Table announced a Summer Grilling Adventures Contest asking people to submit their best grilling recipe that uses Crispin Cider as one of the ingredients. At first it seemed like a waste to not just drink the cider over ice but then I tasted the final result. The pork gets a distinct fresh apple flavor (more apple flavor than I expected actually) with a touch of spices from the brine. The brine also helps the pork remain incredibly juicy. We made a side dish using some kohlrabi from our garden and Crispin as well. Kohlrabi is a member of the cabbage family so I thought it would be good braised like cabbage often is. 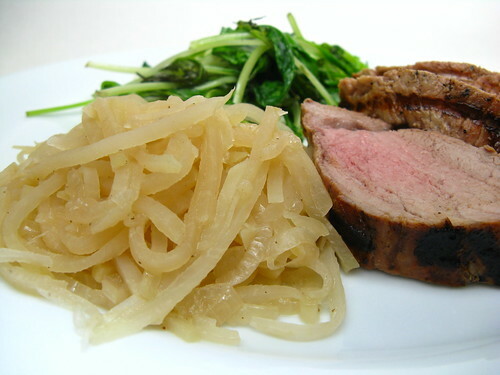 It gets a sweet, apple flavor that is perfect with the pork. I also like the fact that kohlrabi retains a bit of a crunch. We used the brut variety of Crispin which they describe as "European-style extra-dry over ice. The 'champagne' of ciders; combining subtlety and sophistication; the epitome of unforced elegance. A crisp fresh apple bouquet with a brisk, refined finish that lingers on the palate." Put the pork into a resealable bag. Add the brine. Get as much air as possible out of the bag & seal. Place in a bowl just big enough to hold it. Refrigerate for at least 4 hours up to overnight. Heat grill to medium-high. Remove pork from brine & place over direct heat. Grill until pork reaches 160 F, turning from time to time. 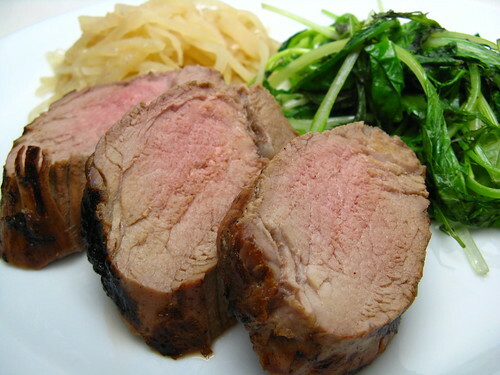 Remove pork from grill & let rest 5 minutes before slicing in 1/2-inch slices. Put all the ingredients in a small saucepan & bring to a boil. Reduce the heat & simmer for ten minutes. (Your kitchen will start to smell like some fabulous baked good & that's not a bad thing.) Let cool to room temperature before adding to meat. Melt butter in a saucepan over medium high heat. Add the onions & cook until turning a golden brown, about 10 - 15 minutes. Add kohlrabi, cider, vinegar & brown sugar. Season with salt & pepper. Reduce heat to a simmer, cover & cook for about 30 minutes until most of the liquid as been absorb. Sounds great - I'm a Twin Cities local, too, and would love to try the cider. Where did you find it? I checked their site, but didn't see a distributor list or buying info. Claire - We've bought it at both South Lyndale Liquor in Mpls & Four Firkins in St. Louis Park. I know bars in the area like The Happy Gnome have it as well. I love love love hard cider! I love those bottles it comes in, really makes you think "crisp"! My favorite cider is Woodchuck Dark and Dry! I'm a beer drinker but I will say this is the best cider I've had. Much better than many of the overly sweet ciders on the market. Brut is my favorite of their line up so I might have to give this recipe a try. Then I can drink the other 3 bottles. LOVE the idea of using cider on the pork! I've been doing experiments cooking with beer lately, and this looks like a really good variation. And I love me some kohlrabi too!! When you put sweetcorn on your pizza, I thought you had gone nuts. But now you have redeemed yourselves. This looks wonderful! I do like a good cider. I have never had hard cider. Looks like I need to try it. What an innovative recipe! I especially like the imaginative kohlrabi dish. No one else at my house likes it but me... but this might win them over! I don't drink alcohol much, but I do enjoy a hard cider now and then! I'll be eager to hear how the Honey Crisp cider is in Oct.
Did you guys win for this recipe? It looks amazing!!!!! Congratulations!! I just saw the announcement on Heavy Table that you've won their recipe contest. 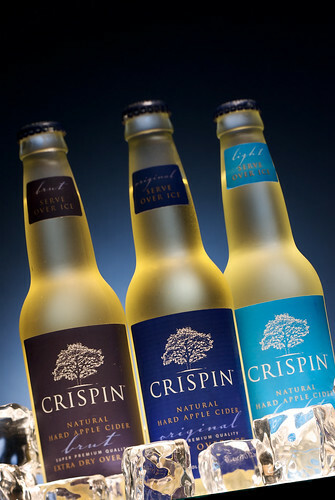 I've yet to try Crispin but I am going to head to their site right now and find out where I can find some. In the meantime, I'm bookmarking this post not only for this insanely delicious-looking cider-brined pork but also for the braised kohlrabi, my new favorite vegetable! I hope you're having an awesome time in India!